A new report is rekindling speculation about the prospect of "Trump TV." "Donald Trump's son-in-law Jared Kushner has informally approached one of the media industry's top dealmakers about the prospect of setting up a Trump television network after the presidential election in November," the Financial Times reported Monday. "These guys still think they have a chance," a friend of Kushner's said Monday. Meaning: members of Trump's inner circle believe Trump has a real shot at the presidency, despite polling data saying otherwise, so they are focused on the campaign, not a network launch. That said, Kushner did have an informal conversation with LionTree founder Aryeh Bourkoff, who specializes in media and technology deals, according to a source with knowledge of the matter. The FT reported that the conversation took place weeks ago, and there hasn't been any followup. The news was met with mock surprise from people who have been predicting that Trump will try to channel his supporters' passion into a profitable media enterprise after Election Day. "Who could have possibly seen this one coming?" anti-Trump Republican Senator Ben Sasse tweeted. Kushner and Bourkoff did not respond to requests for comment from CNNMoney. A Trump campaign spokeswoman declined to comment. 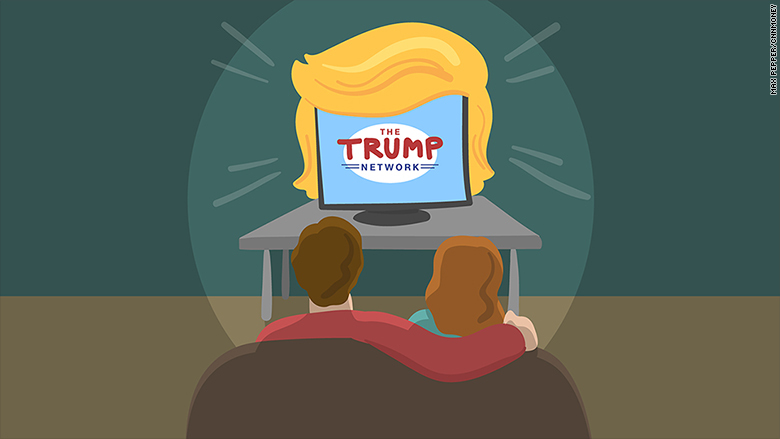 Last month Trump denied that he is seeking to launch a television network or streaming service if he loses the election. "I have no interest in a media company. False rumor," he told The Washington Post. To outside observers, a "Trump TV" business is a logical next step for Trump if he loses. Trump's anti-media campaign could naturally turn into a marketing pitch like this: "The media rigged the election against us. That's why we need our own channel." But it would also be very difficult to pull off. "Trump will be fantastic at it, because you can just keep juicing those people up and saying crazier and crazier things, and they will just keep paying you money, and you will make $20 million a year," Glenn Beck said on "Reliable Sources" in September. Beck pioneered a direct-to-subscribers network several years ago. He said he learned that "it is a lot harder than you think." CNN president Jeff Zucker said something similar when he was asked about the prospect of a Trump network during a Harvard forum last week. "It's harder to do than people think it is," Zucker said. "I think it's possible, but I'd be surprised if that happened. But I don't know." A Trump-branded conservative media venture would potentially challenge Fox News from the right. Trump's campaign chairman Steve Bannon, who came over from Breitbart News, has been building up Breitbart for years as a rival to Fox. The millions of voters now supporting him amount to a built-in customer base.